?8 Levels Magnetic Resistance Adjustable?8 levels of magnetic resistance that you can alter your workout aimed to help you meet your fitness goals. ?13 Inch Non-slip Pedal?Pedals is designed to Non-slip and big to increase stability and comfort,ensure safe pedaling in the most demanding strenuous exercise! And the 13in Stride Length provides a no impact, smooth flowing workout for your total body workout. ?Digital Monitor Display?Start planning and recording your fitness statistics by using the advanced LCD digital monitor which indicates distance, calories burned, time, speed, scan and target zone heart rate monitoring. ?Smooth & Quiet Driven?The precision balanced flywheel and V- belt drive provide a smooth and quiet operation. You can enjoy the convenience of working out without leaving the comfort of home. 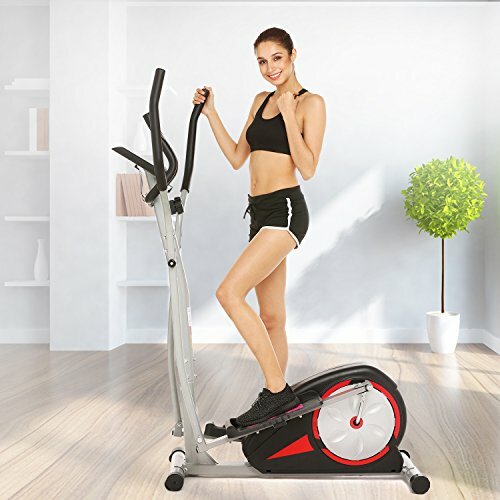 ?Portable and Easy to Move?Elliptical Machine is portable and easy to move by the convenient transport wheels from somewhere of the house into your own private fitness room.